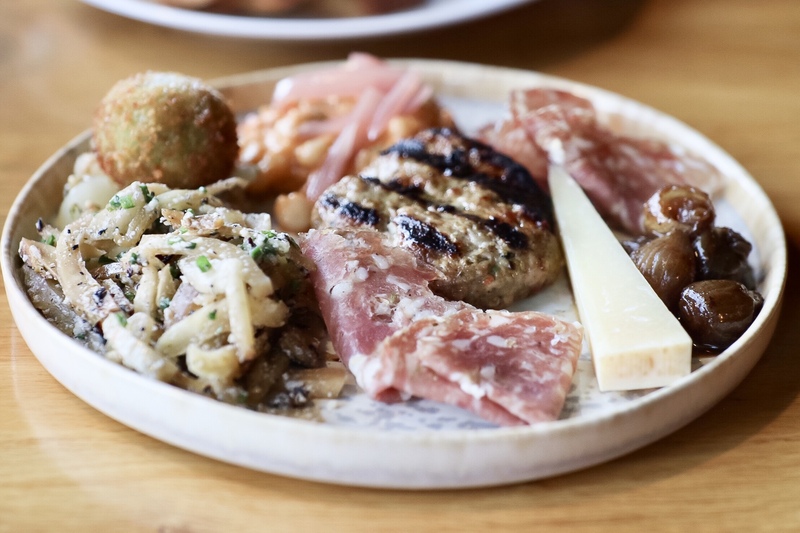 If you like to start with your Italian dinner with some antipasti with an aperitif cocktail, you will be pleased to see the Negroni Lounge menu at Fiore. With 10 adaptations of the classic drink invented in Florence, Italy, there is a great chance for you to find the favourite one. 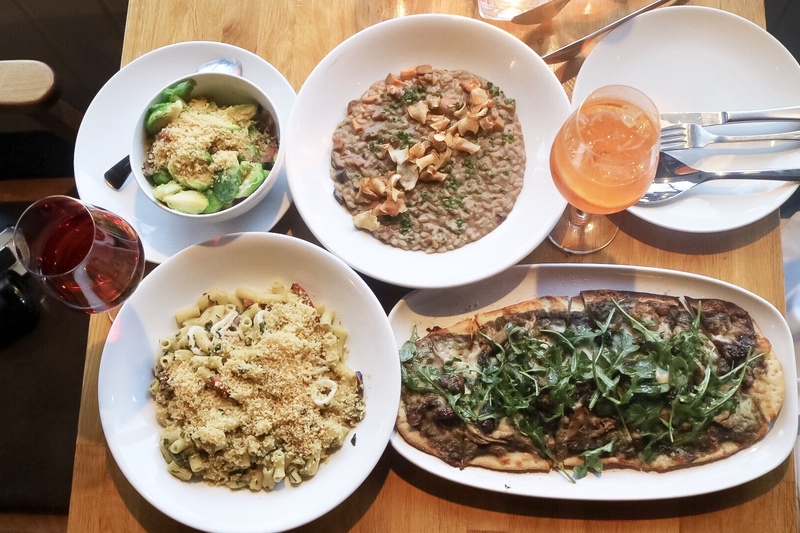 My first impression of Fiore was from last year’s Tasting Plates South Granville, a restaurant crawl event that helps locals discover good eats in the neighbourhood. 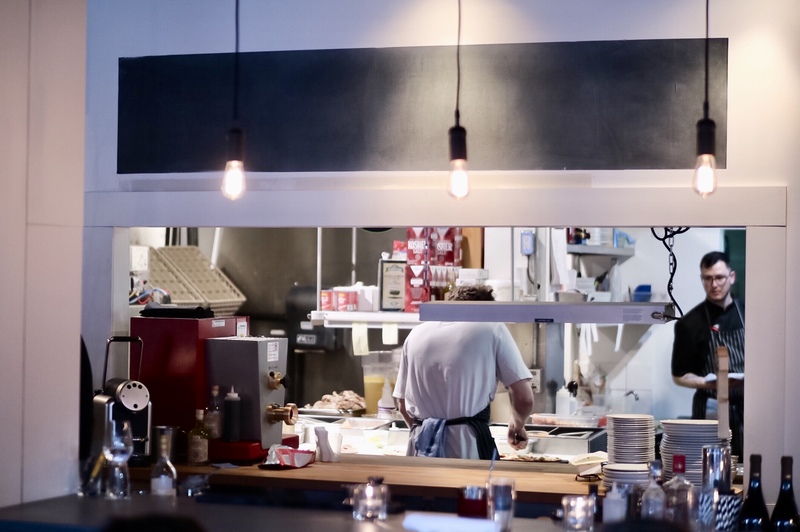 “Neighbourhood gem” is probably best for describing the restaurant – cozy, friendly, and elegant, and perfect for a neighbourhood that is known for shopping, galleries, and casual fine dining. This time I was getting more than a small tasting plate – I was invited to try quite a few things on the newly revamped menu by the eatery’s executive chef, Carlos Rodriguez. I also received a warm welcome from Fiore’s Manager, Jakub Palous, who always manages the sister restaurant, Famiglia in Kitsilano. First, time to find out which negroni I have the mood for. The Boulevardier ($12) is strong, but quite smooth. Knowing Campari as the assertive spirit, balancing it with the choice of bourbon does matter a lot. And they have found a good one for it. 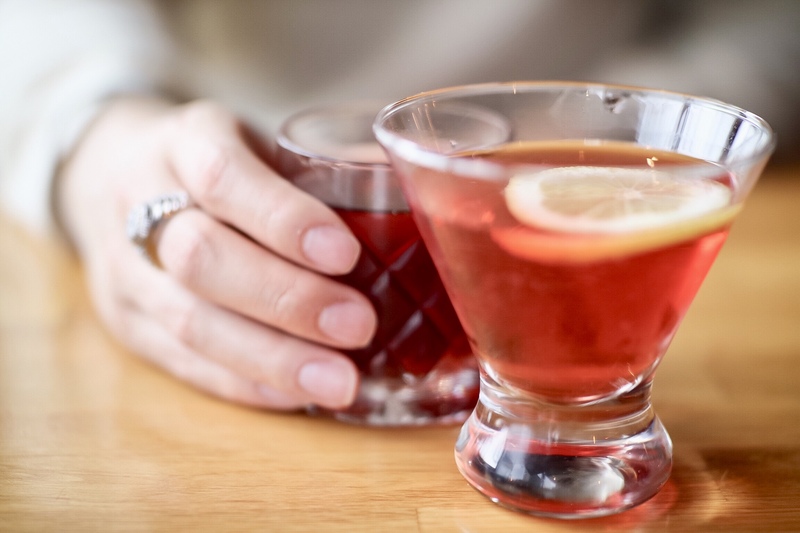 The Pink Negroni ($12) is a lovely choice for something light and fruitier is desired – replacing sweet vermouth with fresh lemon juice, Lillet Blanc, and bitters has done the trick. 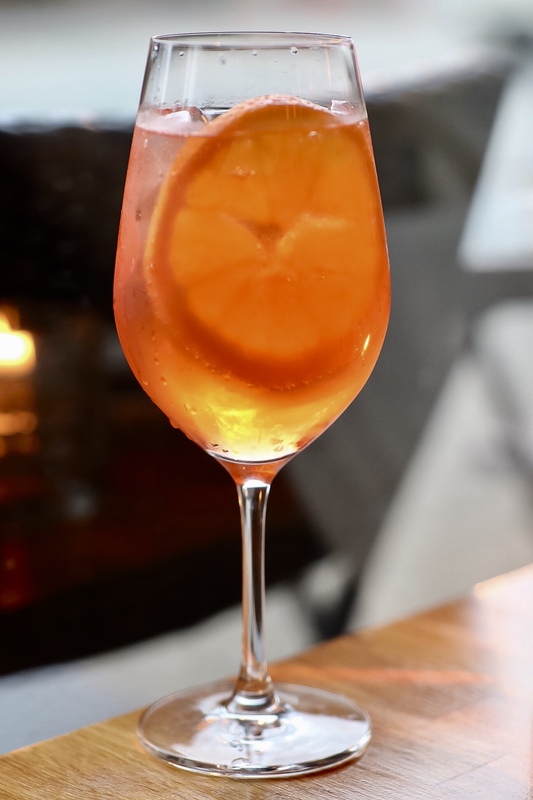 And of course, if you are not a fan of negroni, the Aperol Spritz ($12) would be another classic aperitif choice to warm up your appetite. 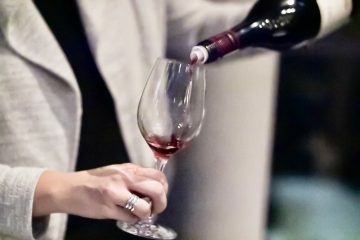 Besides the cocktail program, Fiore offers a well-curated wine list, done by Matt Landry, a 2019 BC Best Sommelier and Vinitaly Italian Wine Ambassador, consisting mostly imports from Italy and a few from other regions. 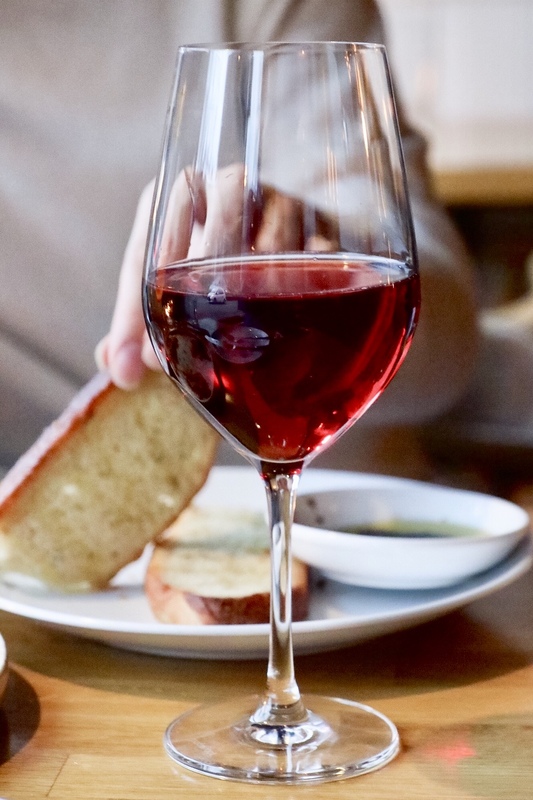 I was recommended to try the 2016 Cembra Schiava ($13) of Italy, which struck me with a quality between Pinot Noir and Gamay – light red liquid with elegant aroma with notes of berries; soft, slightly acidic, and well-balanced on the palate. If you can’t choose between red or white for your dinner, this is the perfect choice. Fiore also offers happy hour (from 8:30 pm to close) with all cocktails for $8, draft beer for $5 and selected wines for $7/glass. Sipping the cocktails we were easing into the mood for the appetizer, the Antipasti Board ($20), featuring Asiago cheese, agrodolce (sweet & sour shallots), finocchiona (Tuscany salami), soppressata (Italian salami), arancini (fried risotto ball), grilled fennel salad, house-made sausage, and white bean salad. Some of the items seemed more traditional and some more creative – it’s like having several tapas dishes on the same platter. 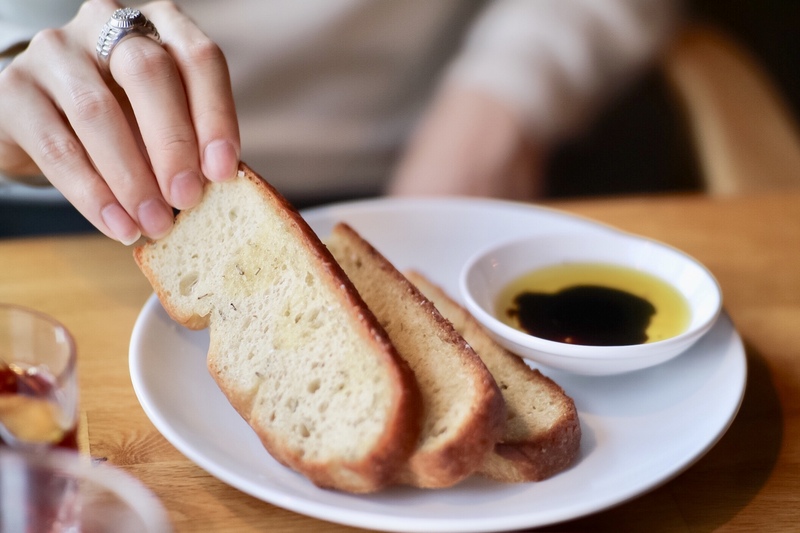 The House Bread comes with evoo and balsamic, and I really enjoyed the texture. Handcrafted pasta is one of the highlights on the menu. The Squid Rigatoni ($22) and the Risotto ($22) both show creativity and finesse, as well as utilizing fresh local ingredients. 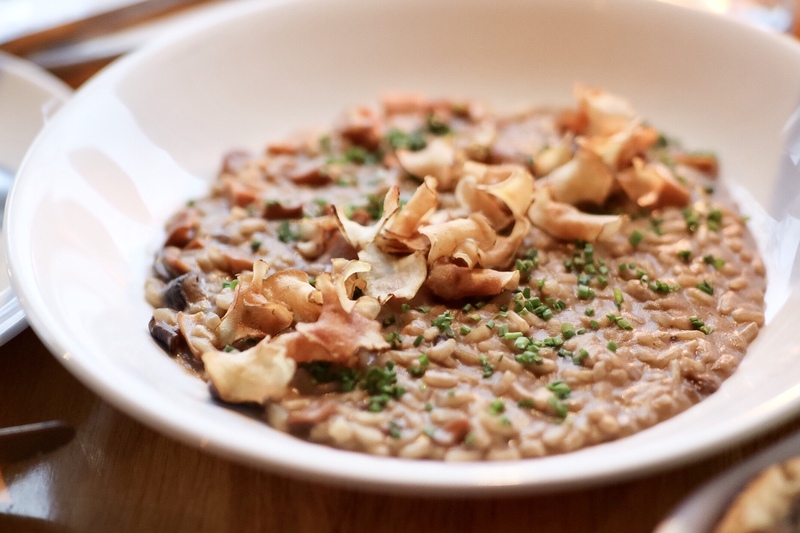 For a texture guy, I adored the crunchy elements of mushrooms and sun-choke chips in the risotto. 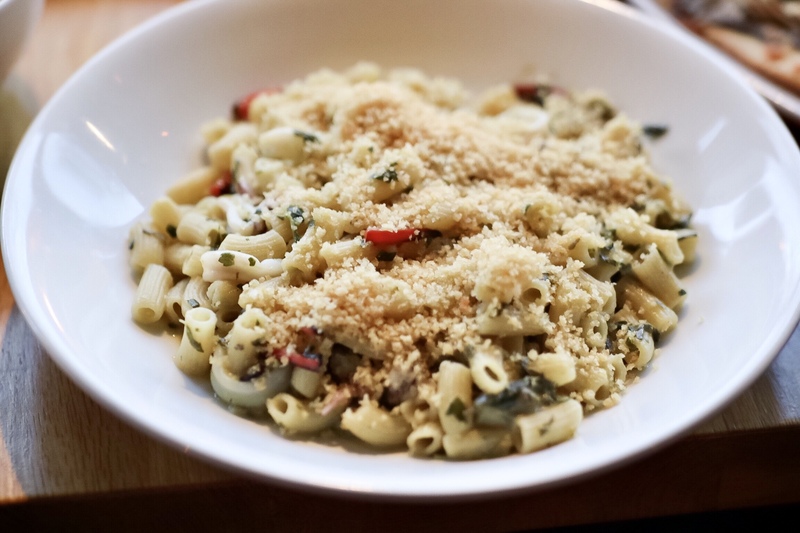 The flavours are very delicate in the squid pasta, as the seasoning is minimal – a bit lemon and fresh herbs, and the flavours do not pop as much as other dishes. If I’m not ordering other dishes, I would order the pasta dish with a glass of rose. The following pair really hit the spot for me, and they make such a great meal combination: the Duck Roman-Style Pizza ($15), and the Brussels Sprouts ($9). 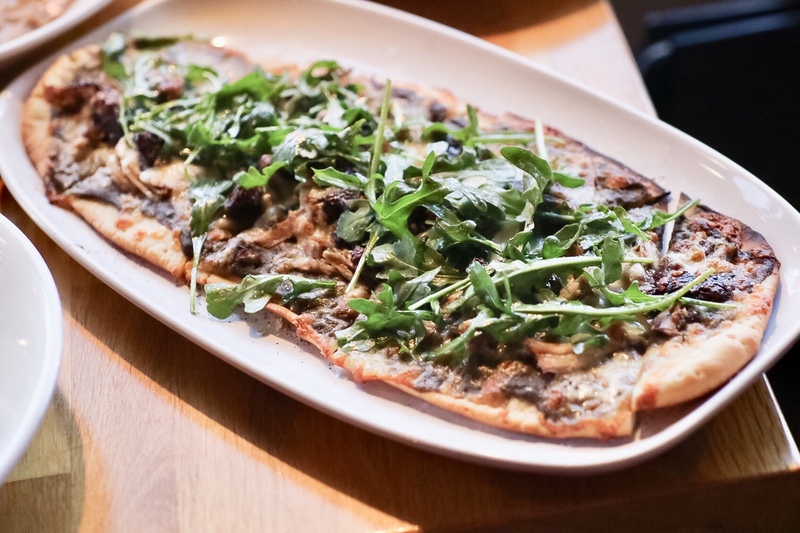 The thin-crust pizza features fig, balsamic, arugula, and grilled onions with chunks of flavourful duck meat as the hidden treasure in each bite. The Brussels sprouts are bright green and slightly crunchy, indicating the freshness. 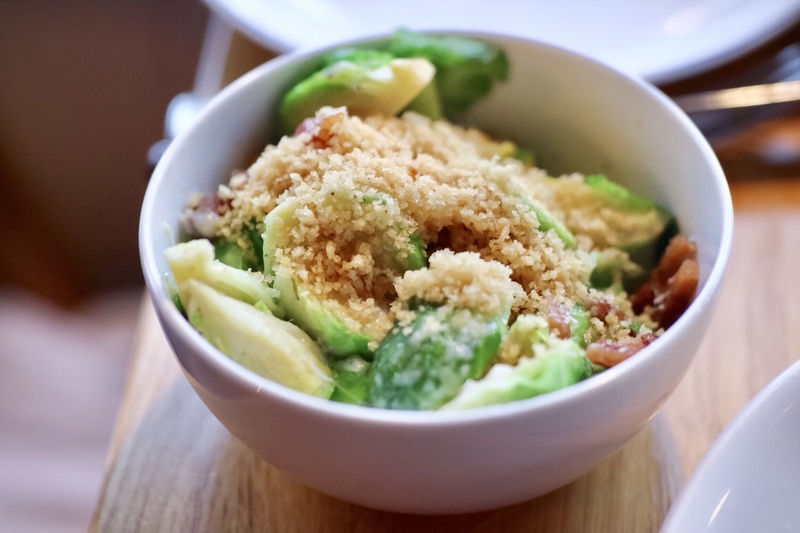 I also loved the thick cuts of bacon in the vegetable side dish, which enhanced each bite with more flavour and heartiness. 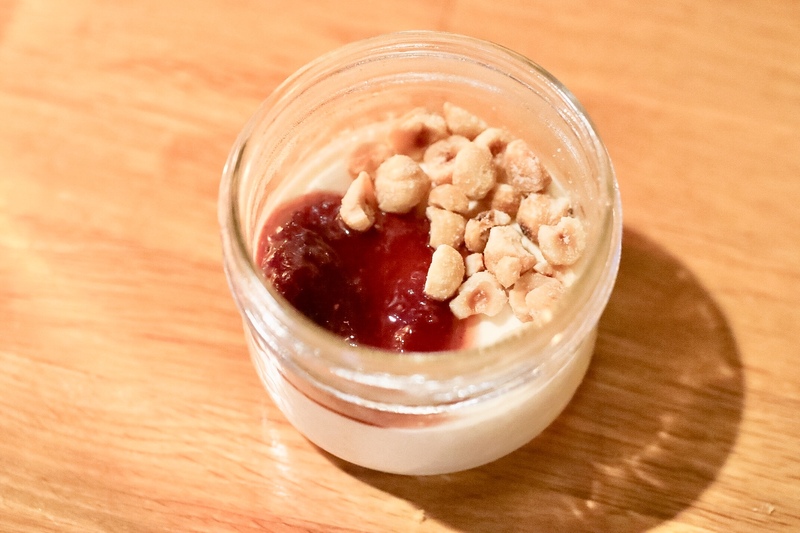 For dessert, my lovely guest and I shared a Vanilla Panna Cotta ($9) topped with raspberry compote and hazelnuts. They also offer the classic Tiramisu ($9) on the dessert menu. As a cocktail and wine lover, I adore the beverage program. I also appreciate the restaurant for offering Italian classics but prepared with local in-season ingredients, and also for the casual but refined setting. The happy hour here sounds like an incredible deal for the neighbourhood. 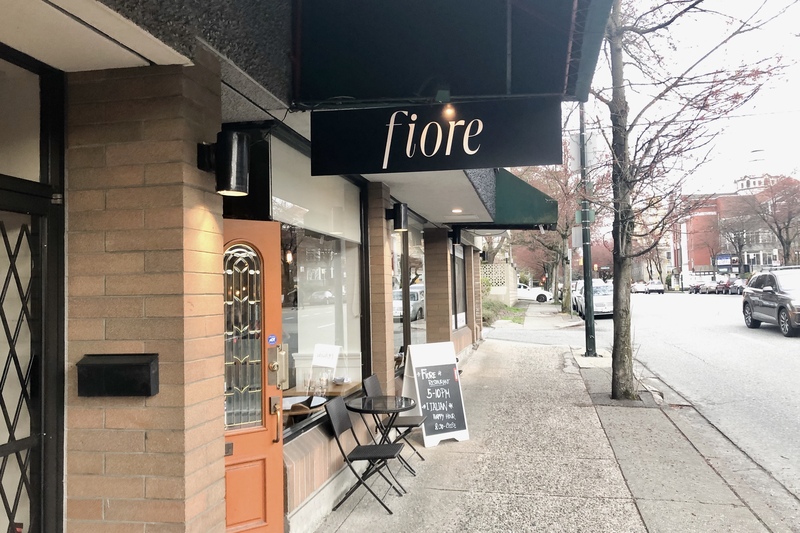 Pop-up dinner alert: Top Chef Canada Runner-up, Mark Singson, is hosting pop-up dinner at Fiore on April 14 and April 28. For tickets, check out @MarkSingson.